Some of the links below are affiliate links-thank you for supporting Southern & Style. If you've been reading here for a while now, you would know that I usually don't have fashion posts up on the blog. For one, I'm not 100% comfortable in front of the camera (I'm working on it) & two, up until recently I didn't think I had anyone to take my blog photos for me...but on Sunday, my Mama agreed to take a couple shots for me and I'm so glad she did because now that might mean y'all get to see more fashion related content-yay for Mom-tographers! We don't claim to be professionals (& these are taken on my iPhone because my DSLR died right when we took the first shot 😿) so just enjoy! 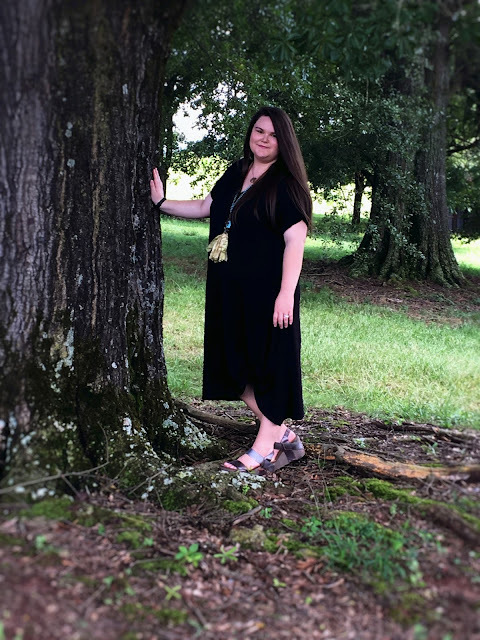 I really enjoy this black midi dress with the knot hem, it's so very comfortable & perfect for summer weather in Alabama because it's loose and breathable. My OTBTs are a staple shoe in my closet, I literally don't want to own any other wedge now because these are so comfortable. The real star of the show here are the two vintage/boho-chic accessories that I'm wearing: the gorgeous turquoise cross earrings & the turquoise beaded necklace with the mustard fabric tassel. Both of these pieces are from Plunder and my sweet friend Kristi Harrison and I am absolutely in love with both of them. The necklace above is stunning; sometimes I have a difficulty with long statement necklaces because of my bust, but this necklace is just long enough and not heavy-it doesn't hurt my neck at all. The colors are perfect for now & will be beautiful for Fall as well. 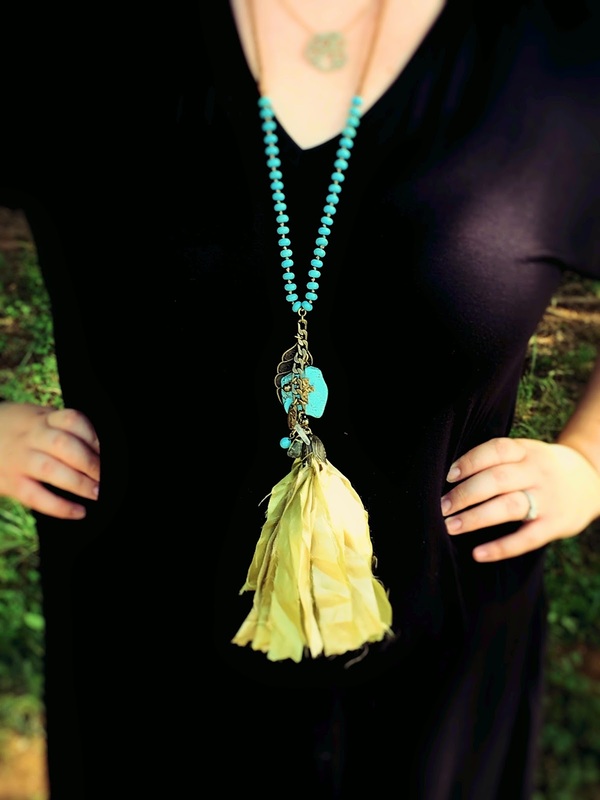 In addition to the leather details at the neck, the turquoise beading, and the mustard fabric tassel, there are little charms also attached: a piece of turquoise with a cross, little beads, & a small geode-type stone. 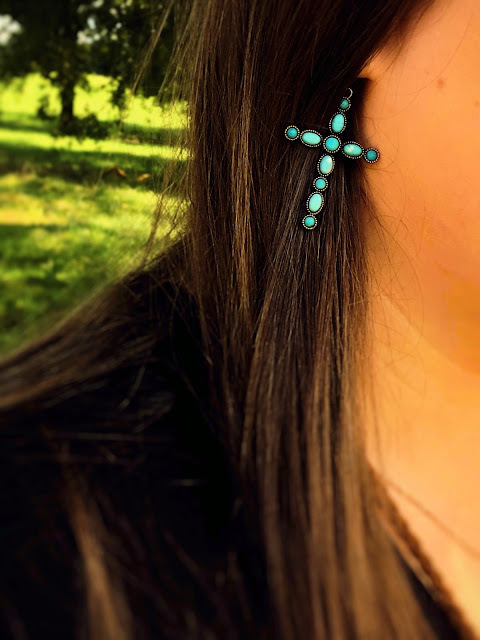 These earrings are the "Grace Earrings" from Plunder & y'all-they are only $10! They are beautiful earrings with a light-weight feel, without sacrificing style. I can promise y'all that these are on my trip to Nashville with me right now-they're perfect. 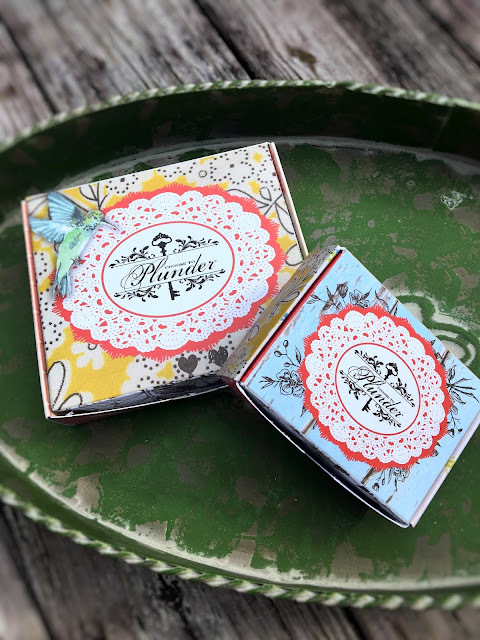 Plunder's packaging is beautiful as well, just look at these pretty little vintage inspired boxes! 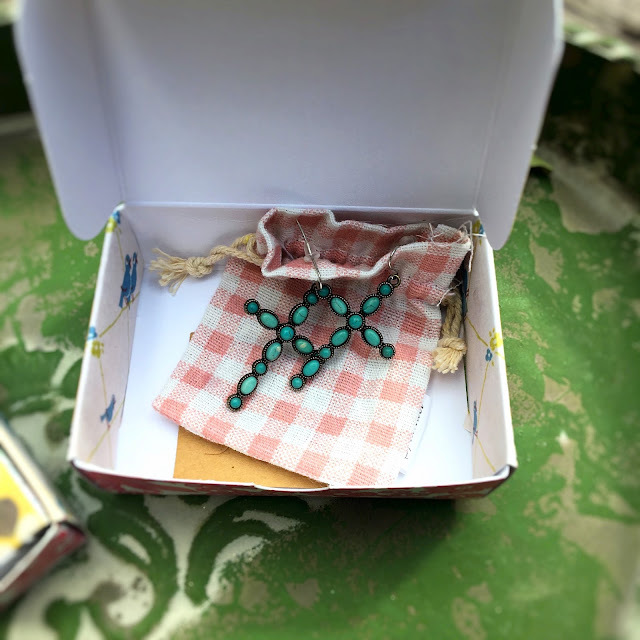 Each piece came protected in it's own jewelry pouch (the earrings were also on a card, which is underneath the bag). I just think the little pink gingham is too cute & will definitely protect these earrings for their trip to Nashville. This close up shot really shows you the detail on the necklace, it's really beautiful! It also came in a gauzy jewelry pouch, ideal for storage or transportation. You can also see the variation of shades in the fabric of the tassel, each piece truly is a work of art. I hope y'all loved this post as much as I did, it was so fun to share outfits on the blog for the first time! Her shop is here if you're interested in checking out any Plunder pieces for yourself-they would make amazing birthday or Christmas gifts, even back-to-school gifts for teachers! 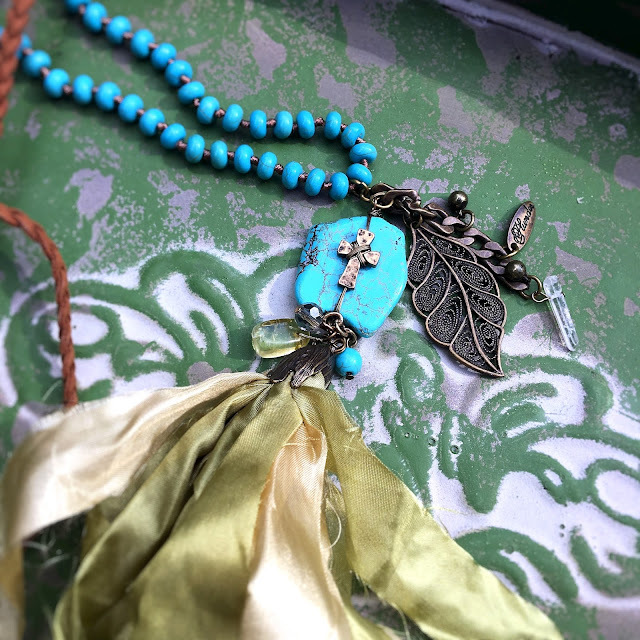 The jewelry pieces were provided by Kristi Harrison who is affiliated with Plunder Design, however this post is not sponsored and all opinions are my own. 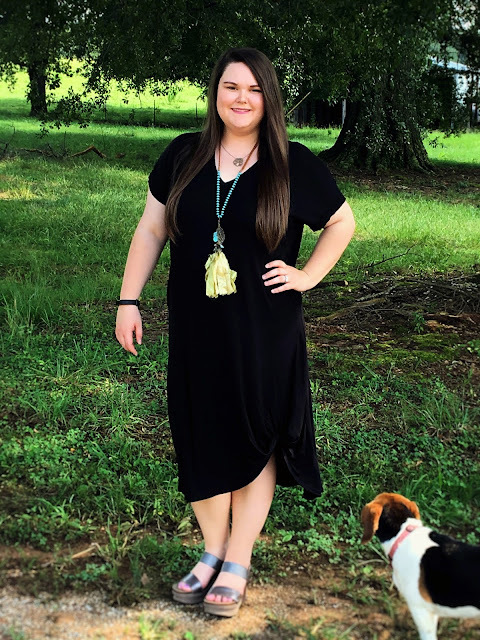 What a great LBD and that necklace is so fun! That dress is so cute and I love that jewelry. :) Especially the necklace! That necklace is too fun and I love that dress! So pretty! 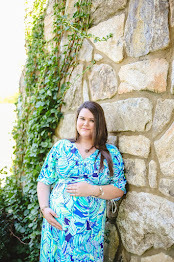 I love all your turquoise accessories! The packaging is so cute too. I wear a lot of black so I'm always looking for shoes and necklaces that add a bit of color. ohhh i love this dress! it looks cozy and cute! I was totally against OTBTs for so long and now I think I really need a pair! Such a gorgeous look, Jordyn! I love how you dressed up the casual dress with the necklace! That necklace is so WOW! I love it! I love that your necklace is the statement piece for this look! Such a cute outfit! You look absolutely fabulous in this outfit, lovely!! 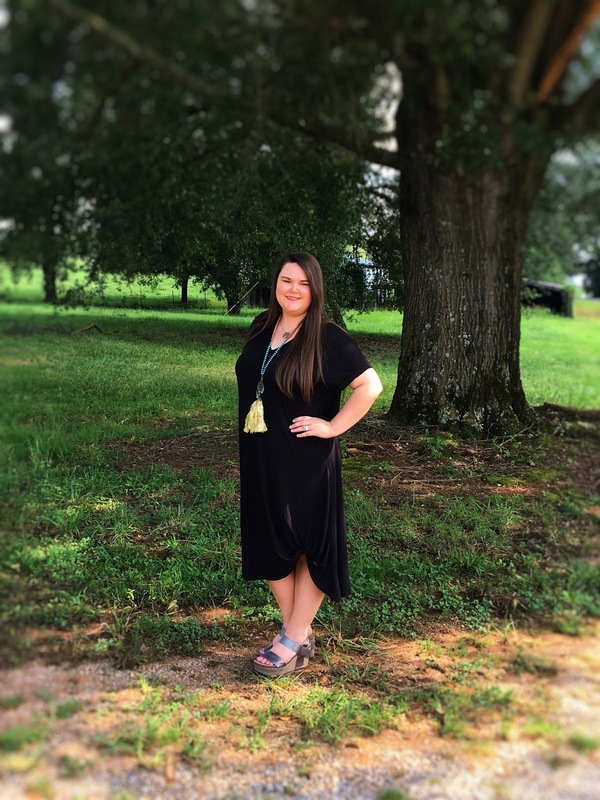 LBD are so necessary...and I absolutely love that you can accessorize with any color!!! love this and love your accessories!!! 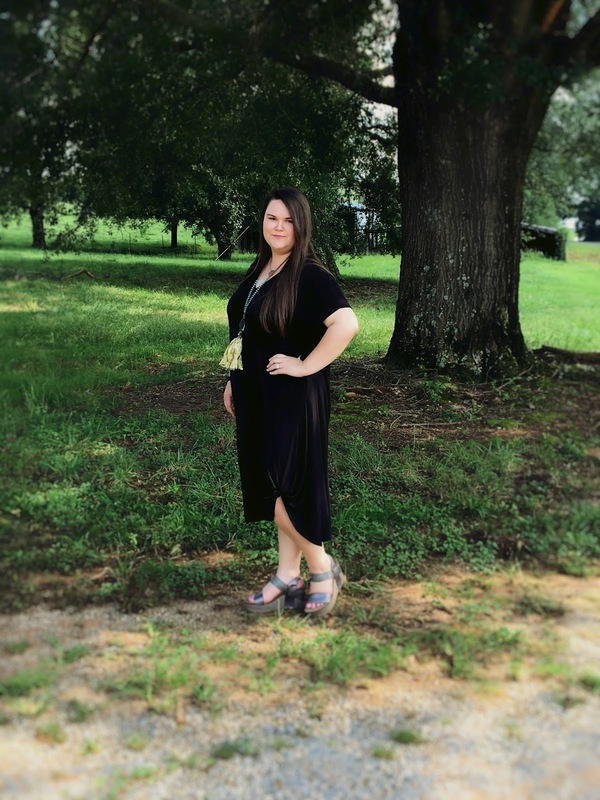 You can never go wrong with the LBD! Especially paired with a statement necklace!